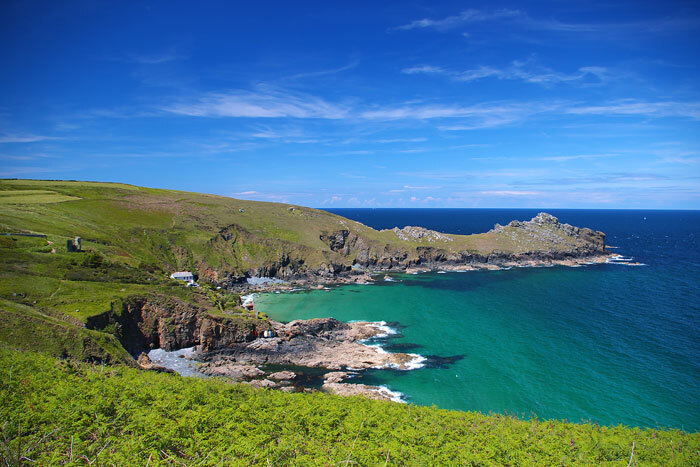 Coasts are the areas of interface between the land and the sea, and the coastal environment can comprise a variety of zones, including coastal plains, beaches, barriers and lagoons. The shoreline is the actual margin between the land and the sea. Coastlines can be divided into two general categories on the basis of their morphology, wave energy and sediment budget. Erosional coastlines typically have relatively steep gradients where a lot of the wave energy is reflected back into the sea from the shoreline: both bedrock and loose material may be removed from the coast and redistributed by wave, tide and current processes. 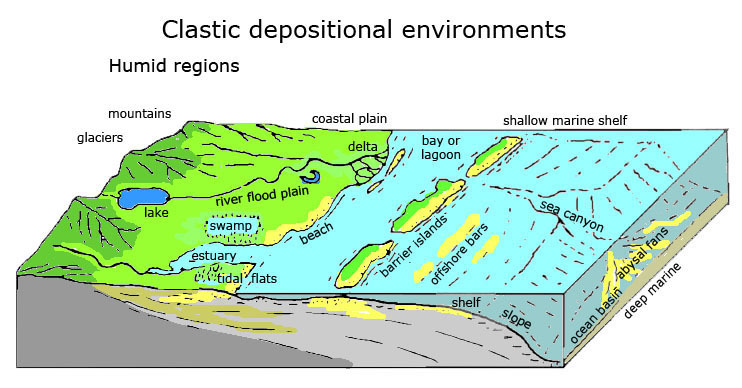 At depositional coastlines the gradient is normally relatively gentle and a lot of the wave energy is dissipated in shallow water: provided that there is a supply of sediment, these dissipative coasts can be sites of accumulation of sediment. Exposure of bedrock in cliffs allows both physical and chemical processes of weathering: oxidation and hydration reactions are favoured in the wet environment, and the growth of salt crystals within cracks of rocks sprayed with seawater can play an important role in breaking up thematerial. Material accumulates at the foot of cliffs as loose clastic detritus and occasionally as large blocks when whole sections of the cliff face are removed. Cliff erosion may result in wave cut platforms of bedrock eroded subhorizontally at beach level. Wave action, storms and tidal currents will then remove the debris as bedload, as suspended load or in solution. This contributes to the supply of sediment to the marine environment, and away from river mouths can be an important source of clastic detritus to the shallow marine realm. A coastline that is a site of accumulation of sediment must have an adequate supply of material to build up a deposit. The sources of this sediment are from the marine realm, either terrigenous clastic detritus reworked from other sources or bioclastic debris. The terrigenous material ultimately comes from rivers, with a small proportion of wind-blown origin and from direct erosion of coastlines. This sediment is brought to a depositional coastline by tidal, winddriven and geostrophic currents that transport material parallel to shorelines or across shallow seas. Wind-driven waves acting obliquely to the shoreline are an important mechanism of transport, creating a shore-parallel current known as longshore drift. Shallow seas are generally rich in fauna, and the remains of the hard parts of these organisms provide an important source of bioclastic material to coastlines. The form of a depositional coastline is determined by the supply of sediment, the wave energy, the tidal range and the climate. Climate exerts a strong control on coasts that are primarily sites of carbonate and evaporite deposition, and these environments. Along clastic coastlines a beach of sandy or gravelly material forms where there is a sufficient supply of clastic sediment and enough wave energy to transport the material on the foreshore. The form of the beach, and the development of barrier systems and lagoons, is dependent on whether the coastline is in a micro-, meso- or macrotidal regime. Sea-level changes also strongly influence coastal morphology. In the following sections the processes related to beach formation are first considered, followed by a description of the morphologies that can exist in wave-dominated and tidally influenced coasts. The beach is the area washed by waves breaking on the coast. The seaward part of the beach is the foreshore, which is a flat surface where waves go back and forth and which is gently dipping towards the sea. Where wave energy is sufficiently strong, sandy and gravelly material may be continuously reworked on the foreshore, abrading clasts of all sizes to a high degree of roundness, and effectively sorting sediment into different sizes. Sandy sediment is deposited in layers parallel to the slope of the foreshore, dipping offshore at only a few degrees to the horizontal (much less than the angle of repose). This low-angle stratification of well-sorted, well-rounded sediment is particularly characteristic of wave-dominated sandy beach environments. Grains are typically compositionally mature as well as texturally mature because the continued abrasion in the beach swash zone tends to break down the weaker clasts. On gravel beaches the water washed up the beach by each wave tends to percolate down into the porous gravel, and the backwash of each wave is therefore weak. Clasts that are washed up the beach will therefore tend to build up to form a storm ridge at the top of the foreshore, a back-beach gravel ridge that is a distinctive feature of gravelly beaches. The clast composition will vary according to local sediment supply, and may contain terrigenous clastic, volcaniclastic or bioclastic debris. At the top of the beach, a ridge, known as a berm, marks the division between the foreshore and backshore area. Water only washes over the top of the berm under storm-surge conditions. Sediment carried by the waves over the berm crest is deposited on the landward side forming layers in the backshore that dip gently landward. These low-angle strata are typically truncated by the foreshore stratification, to form a pattern of sedimentary structures that may be considered to be typical of the beach environment. The backshore area may become colonised by plants and loose sand can be reworked by aeolian processes. Wave action in the lower part of the foreshore can rework sand and fine gravel into wave ripples that can be seen on the sediment surface at low tide and can be preserved as wave-ripple cross-lamination. However, wave-formed sedimentary structures on the beach may be obliterated by organisms living in the intertidal environment and burrowing into the sediment. This bioturbation may obscure any other sedimentary structures. Aeolian processes can act on any loose sediment exposed to the air. Along coasts any sand that dries out on the upper part of the beach is subject to reworking by onshore winds that may redeposit it as aeolian dunes. 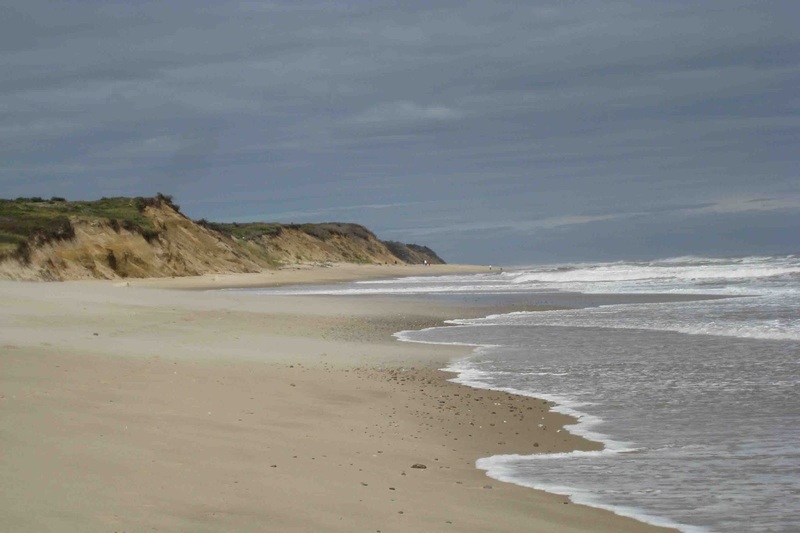 Coastal dunes form as ridges that lie parallel to the shoreline and they may build up to form dune complexes over 10 m high and may stretch hundreds of metres inland. Vegetation (grasses, shrubs and trees) plays an important role in stabilising and trapping sediment. The limiting factor in beach dune ridge growth is the supply of sand from the beach. They commonly form along coasts with a barrier system, but can also be found along strand-plain coasts. In a sedimentary succession these beach dune ridge deposits may be seen as well-sorted sand at the top of the beach succession. Some preservation of the roots of shrubs and trees that colonised the dune field is possible, but the effect of the vegetation is often to disrupt the preservation of well-developed dune cross-bedding. 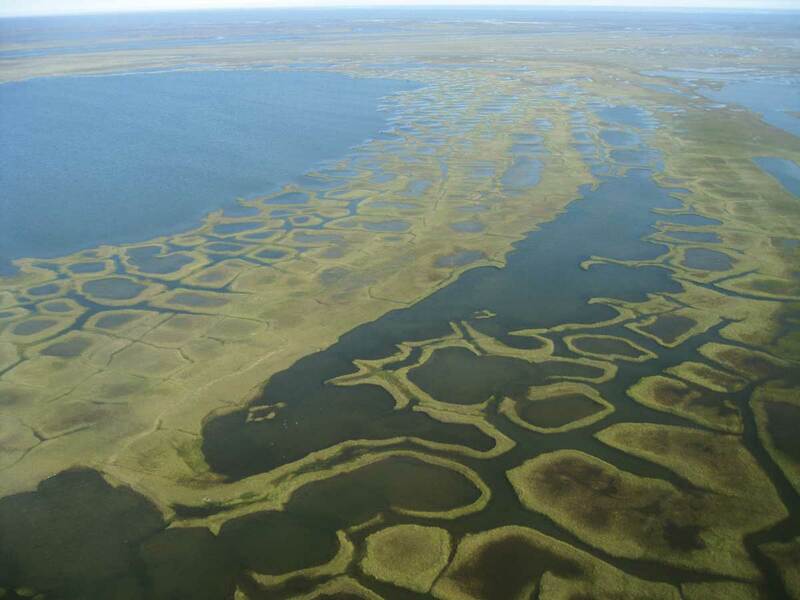 Coastal plains are low-lying areas adjacent to seas. They are part of the continental environment where there are fluvial, alluvial or aeolian processes of sedimentation and pedogenic modification. Coastal plains are influenced by the adjacent marine environment when storm surges result in extensive flooding by seawater. A deposit related to storm flooding can be recognised by features such as the presence of bioclastic debris of a marine fauna amongst deposits that are otherwise wholly continental in character. Sandy coastlines where an extensive area of beach deposits lies directly adjacent to the coastal plain are known as strand plains. Along coasts supplied with sediment, beach ridges create strand plains that form sediment bodies tens to hundreds of metres across and tens to hundreds of kilometres long and progradation of strand plains can produce extensive sandstone bodies. The strand plain is composed of the sediment deposited on the foreshore and backshore region. The backshore area merges into the coastal plain and may show evidence of subaerial conditions such as the formation of aeolian dunes and plant colonisation. The shallower parts of the shelf and epicontinental sea are within the depth zone for wave action and any sediment will be extensively reworked by wave processes. 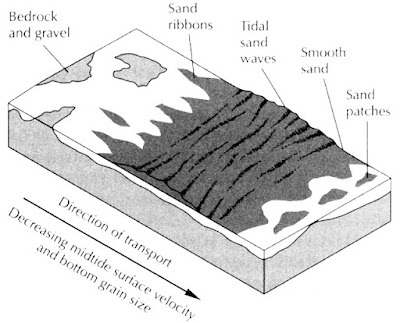 Sands deposited in these settings may preserve wave-ripple cross-lamination and horizontal stratification. Streaks ofmud inflaser beds deposited during intervals of lower wave energy become more common in the deposits of slightly deeper water further offshore. Wave ripples are less common as the fair-weather wave base is approached in the lower part of the shoreface. Within the shoreface zone sand ridges may be formed by flows generated by eddy currents related to storms and/or wave-driven longshore drift. These ridges occur in water depths of 5 to 15 m and are oriented obliquely to the coastline as oblique longshore bars. They are up to about 10 m high, a few kilometres wide and tens of kilometres in length, occurring spaced about 10 km apart. The sediments are typically well-sorted sands with a basal lag of gravel. In the offshore transition zone, between the fairweather and storm wave bases on storm-dominated shelves, sands are deposited and reworked by storms. A storm creates conditions for the formation of bedforms and sedimentary structures that seem to be exclusive to storm-influenced environments. Hummocky cross-stratification (often abbreviated to HCS) is distinctive in form, consisting of rounded mounds of sand on the sea floor a few centimetres high and tens of centimetres across. The crests of the hummocks are tens of centimetres to a metre apart. Internal stratification of these hummocks is convex upwards, dips in all directions at angles of up to 108 or 208, and thickens laterally: these features are not seen in any other form of cross-stratification. Between the hummocks lie swales and where concave layers in them are preserved this is sometimes called swaley cross-stratification (abbreviated to SCS). Hummocky and swaley cross-stratification are believed to form as a result of combined flow, that is, the action of both waves and a current. This occurs when a current is generated by a storm at the same time as high-amplitude waves reach deep below the surface. The strong current takes sand out into the deeper water in temporary suspension and as it is deposited the oscillatory motion caused by the waves results in deposition in the form of hummocks and swales. Swaley cross-stratification is mainly formed and preserved in shallow water where the hummocks have a lower preservation potential. One of the characteristics of HCS/SCS is that these structures are normally only seen in fine to medium grained sand, suggesting that there is some grain-size limitation involved in this process. Storm conditions affect the water to depths of 20 to 50 m or more so HCS/SCS may be expected in any sandy sediments on the shelf to depths of several tens of metres. These structures are not seen in shoreface deposits above fair-weather wave base due to reworking of the sediment by ordinary wave processes, so this characteristic form of cross-stratification is found only in sands deposited in the offshore transition zone. Individual storm deposits, tempestites, deposited by single storm events typically taper in thickness from a few tens of centimetres to millimetre-thick beds in the outer parts of this zone several tens of kilometres offshore. Proximal tempestites have erosive bases and are composed of coarse detritus, whereas the distal parts of the bed are finer-grained laminated sands: hummocky and swaley cross-stratification occurs in the sandy parts of tempestites. An idealised tempestite bed will have a sharp, possibly erosive base, overlain by structureless coarse sediment (coarse sand and/or gravel): the scouring and initial deposition occurs when the storm is at its peak strength. As the storm wanes, hummocky–swaley cross-stratification forms in finer sands and this is overlain by fine sand and silt that shows horizontal and wave-ripple lamination formed as the strength of the oscillation decreases. At the top of the bed the sediment grades into mud. The magnitude of the storms that deposit beds tens of centimetres thick is not easy to estimate, because the availability of sand is probably of equal importance to the storm energy in determining the thickness of the bed. In the periods between storm events this part of the shelf is an area of deposition of mud from suspension. This fine-grained clastic material is sourced from river mouths and is carried in suspension by geostrophic and wind-driven currents, and storms also rework a lot of fine sediment from the sea floor and carry it in suspension across the shelf. Storm deposits are therefore separated by layers of mud, except in cases where the mud is eroded away by the subsequent storm. The proportion of mud in the sediments increases offshore as the amount of sand deposited by storms decreases. The outer shelf area below storm wave base, the offshore zone, is predominantly a region of mud deposition. Exceptional storms may have some effect on this deeper part of the shelf, and will be represented by thin, fine sand deposits interbedded with the mudstone. Ichnofauna are typically less diverse and abundant than the associations found in the shoreface and offshore transition zone. The sediments are commonly grey because this part of the sea floor is relatively poorly oxygenated allowing some preservation of organic matter within the mud. 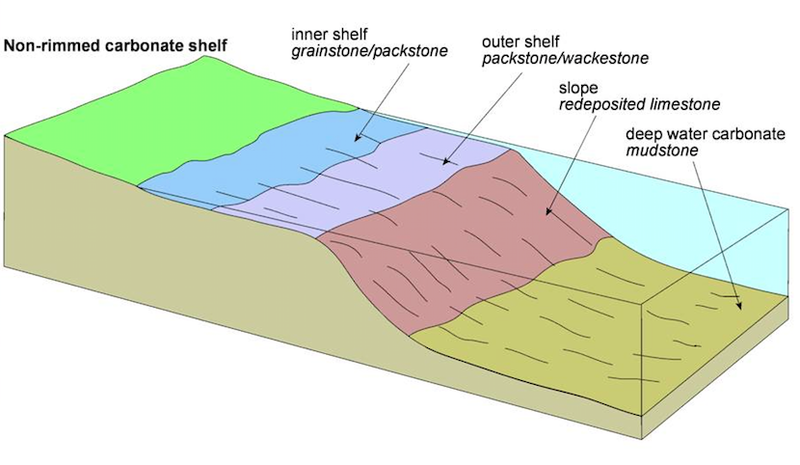 If there is a constant sediment supply to the shelf, continued deposition builds up the layers on the sea bed and the water becomes shallower. Shelf areas that were formerly below storm wave base experience the effects of storms and become part of the offshore transition zone. Similarly addition of sediment to the sea floor in the offshore transition zone brings the sea bed up into the shoreface zone above fair-weather wave base and a vertical succession of facies that progressively shallow upwards is constructed. The offshore facies mainly consists of mudstone beds with some bioturbation. This is overlain by offshore transition facies made up of sandy tempestite beds interbedded with bioturbated mudstone. The tempestite beds have erosional bases, are normally graded and show some hummocky–swaley cross-stratification. The thickness of the sandstone beds generally increases up through the succession, and the deposits of the shallower part of this zone show more SCS than HCS. The shoreface is characterised by sandy beds with symmetrical (wave) ripple lamination, horizontal stratification and SCS, although sedimentary structures may be obscured by intense bioturbation. Sandstone beds in the shoreface may show a broad lens shape if they were deposited as localised ridges on the shallow sea floor. The top of the succession may be capped by foreshore facies. Some shelf areas are wave- and storm-dominated, but receive large quantities of mud and relatively little sand. They occur close to rivers that have a high suspended load: the plumes of suspended sediment from the mouths of major rivers may extend for tens or hundreds of kilometres out to sea and then are reworked by wind-driven and geostrophic currents across the shelf. Muddy deposits on the inner parts of the shelf are normally intensely bioturbated, except in cases where the rates of sedimentation of mud are so high that accumulation outpaces the rate at which the organisms can rework the sediment. High concentrations of organic matter may make these shelf muds very dark grey or black in colour. 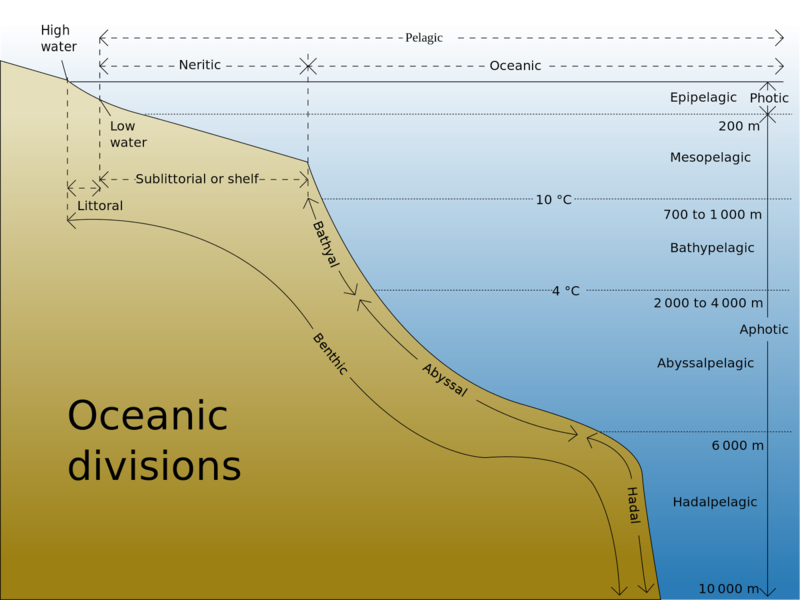 The continental shelves and epicontinental seas are important sites of deposition of sand and mud in the world’s oceans and account for over half the volume of ocean sediments. These successions can be very thick, over 10,000 m, because deposition may be very long-lived and can continue uninterrupted for tens of millions of years. They occur as largely undeformed strata around the edges of continents and also in orogenic belts, where the collision of continental plates has forced beds deposited in shallow marine environments high up into mountain ranges. This chapter focuses on the terrigenous clastic deposits found in shallow seas; carbonate sedimentation, which is also important in these environments. The supply of sediment to shelves is a fundamental control on shallow marine environments and depositional facies of shelves and epicontinental seas. If the area lies adjacent to an uplifted continental region and there is a drainage pattern of rivers delivering detritus to the coast, the shallow-marine sedimentation will be dominated by terrigenous clastic deposits. The highest concentrations of clastic sediment will be near the mouths of major rivers: adjacent coastal regions will also be supplied with sediment by longshore movement of material by waves, storms and tides. Shallow seas that are not supplied by much terrigenous material may be areas of carbonate sedimentation, especially if they are in lower latitudes where the climate is relatively warm. In cooler climates where carbonate production is slower, shelves and shallow seas with low terrigenous sediment supply are considered to be starved. The rate of sediment accumulation is slow and may be exceeded by the rate of subsidence of the sea floor such that the environment becomes gradually deeper with time. Detritus that reaches a shallow sea is likely to have had a history of transport in rivers, may have passed through a delta or estuary, or could have been temporarily deposited along a coastline before it arrives at the shelf. If there is a long history of transport through these other environments the grain assemblage is likely to be mature. Texturally, the grains of sand will have suffered a degree of abrasion and the processes of turbulent flow during transport will separate the material into different grain sizes. The compositional maturity will probably be greater than the equivalent continental deposits, because the more labile minerals and grains (such as feldspar and lithic fragments) are broken down during transport: shallow marine sands are commonly dominated by quartz grains. In polar areas, the sediment supplied is much less mature because cold weather reduces chemical weathering of the grains and glacial transport does not result in much sorting or rounding of the clasts. The detrital component is often complemented by material that orginates in the shallow marine environment. Shallow seas are rich in marine life, including many organisms that have calcareous shells and skeletons. The remains of these biogenic hard parts are a major component of shelf carbonate deposits, but can also be very abundant in sands and muds deposited in these seas. Whole shells and skeletons may be preserved in mudrocks because they are low-energy deposits. In higher energy parts of the sea, currents move sand around and a lot of biogenic debris is broken up into bioclastic fragments ranging from sand-sized, unidentifiable pieces up to larger pieces of shelly material and bone. Bone is also the origin for phosphates that can form as authigenic deposits in shallow marine settings: these phosphates are relatively rare. However, another authigenic mineral, glauconite, is a common component of sandstones and mudrocks formed on shelves and epicontinental seas and is considered to be a reliable indicator of shallow marine conditions. The characteristic dark green colour of the mineral gives sediments rich in it a distinctly green tinge, although it is iron-rich and weathers to a rusty orange colour. ‘Greensands’ are shallowmarine deposits rich in glauconite that are particularly common in Cretaceous strata in the northern hemisphere. Shallow seas are environments rich in animal life, particularly benthic organisms that can leave traces of their activity in the sediments. Bioturbation may form features that are recognisable of the activities of a particular type of organism, but also results in a general churning of the sediment, homogenising it into apparently structureless masses. Primary sedimentary structures (wave ripples, hummocky cross-stratification, trough crossbedding, and so on) are not always preserved in shelf sediments because of the effects of bioturbation. Bioturbation is most intense in shallower water and is frequently more abundant in sandy sediment than in muddy deposits. This is because the currents that transport and deposit sand may also carry nutrients for benthic organisms living in the sand: many organisms also prefer to live on and within a sandy substrate. The abundance of calcareous shell material in shallow-marine sandstones makes calcium carbonate available within the strata when the beds are buried. Groundwater moving through the sediments dissolves and reprecipitates the carbonate as cement. Shelly fossils within sandstones are therefore sometimes found only as casts of the original form, as the original calcite or aragonite shells have been dissolved away. Sandstone beds deposited in shallow marine settings also typically have a calcite cement. The patterns and characteristics of deposition on shelves and epicontinental seas with abundant terrigenous clastic supply are controlled by the relative importance of wave, storm and tidal processes. The largest tidal ranges tend to be in epicontinental seas and restricted parts of shelves, although in some situations the tidal ranges in narrow or restricted seaways can be very small. Open shelf areas facing oceans are typically regions with a microtidal to mesotidal regime and are affected by ocean storms. Two main types, storm-dominated shelves and tide-dominated shelves, can be recognised in both modern environments and ancient facies: these are end-members of a continuum and many modern and ancient shelves and epicontinental seas show influence of both major processes. The majority of modern shelves are storm dominated (80%): the remainder are mainly tide dominated (17%), with just a small number (3%) of shelves influenced mainly by ocean currents. These ocean-current-dominated shelves are generally narrow (less than 10 km) and lie adjacent to strong geostrophic currents: sandwaves and sand ribbons form on them, and as such they are similar to tidal shelves, but the driving current is not of tidal origin. The detailed characteristics of sands deposited on modern shelves can be determined directly only by taking shallow cores that provide a limited amount of information: indirect investigation by geophysical techniques, such as shallow seismic profiles, can also yield some information about the internal structures. Not all sandy deposits occurring on modern shelves have been formed by processes occurring in the present day: the sea-level rise in the past 10 k/yr, the Holocene transgression, has drowned former strand plain and barrier island ridges, along with sands deposited in the shoreface, leaving them as inactive relics in deeper water. The term pelagic refers to the open ocean, and in the context of sedimentology, pelagic sediments are made up of suspended material that was floating in the ocean, away from shorelines, and has settled on the sea floor. This sediment comprises terrigenous dust, mainly clay and some silt-sized particles blown from land areas by winds, very fine volcanic ash, particularly from major eruptions that send fine ejecta high into the atmosphere, and airborne particulates from fires, mainly black carbon. It also includes bioclastic material that may be the remains of calcareous organisms, such as foraminifers and coccoliths, and the siliceous skeletons of Radiolaria and diatoms. All of these particles reside in the ocean water in suspension, moved around by currents near to the surface, but when they reach quieter, deeper water they gradually fall down through the water column to settle on the seabed. The origin of the terrigenous clastic material is airborne dust, and much of this is likely to have come from desert areas. The particles are therefore oxidised and the resulting sediments are usually a dark red-brown colour. These ‘red clays’ are made up of 75% to 90% clay minerals and they are relatively rich in iron and manganese. They lithify to form red or red-brown mudstones. These pelagic red mudrocks are a good example of how the colour of a sedimentary rock should be interpreted with caution: it is tempting to think of all red beds as continental deposits, but these deep-sea facies are red too. The accumulation rate of pelagic clays is very slow, typically only 1 to 5 mm/yr , which means it could take up to a million years of continuous sedimentation to form just a metre of sediment. Pelagic sediments with a biogenic origin are the most abundant type in modern oceans, and two groups of organisms are particularly common in modern seas and are very commonly found in strata of Mesozoic and Cenozoic age as well. Foraminifera are single-celled animals that include a planktonic form with a calcareous shell about a millimetre or a fraction of a millimetre across. Algae belonging to the group chrysophyta include coccoliths that have spherical bodies of calcium carbonate a few tens of microns across; organisms this size are commonly referred to as nanoplankton. The hard parts of these organisms are the main contributors to finegrained deposits that form calcareous ooze on the sea bed: where one group is dominant the deposits may be called a nanoplankton ooze or foraminiferal ooze. Calcareous oozes accumulate at rates ten times that of pelagic clays, around 3 to 50 mm/yr . This sediment consolidates to form a fine-grained limestone, which is a lime mudstone using the Dunham Classification, although these deposits are often called pelagic limestones. The foraminifers are normally too small to be seen with the naked eye, and the coccoliths are only recognisable using an electron microscope. An electron microscope is also required to see any details of the siliceous biogenic material: diatoms are only 5 to 50 mm across while Radiolaria are 50 to 500 mm, so the larger ones can be seen with the naked eye. They are made of opal, a hydrated amorphous form of silica that is relatively soluble, and diatoms in particular are often dissolved. Accumulations of this material on the sea floor are known as siliceous ooze and they form more slowly than calcareous oozes, at between 2 and 10 mm/yr . Upon lithification siliceous oozes form chert beds. The opal is not stable and readily alters to another form of silica such as chalcedony, which makes up the chert rock. Deep sea cherts are distinctive, thinly bedded hard rocks that may be black due to the presence of fine organic carbon, or red if there are terrigenous clays present. The Radiolaria can often be seen as very fine white spots within the rock and where this is the case they are referred to as radiolarian chert. These beds formed from the lithification of a siliceous ooze deposited in deep water (primary chert) should be distinguished from chert formed as nodules due to a diagenetic silicification of a rock (secondary chert). Secondary cherts are developed in a host sediment (usually limestone) and have an irregular nodular shape: they do not provide information about the depositional environment but may be important indicators of the diagenetic history. Pelagic sediments form a significant proportion of the succession only in places that do not receive sediment from other sources, so any ocean areas close to margins tend to be dominated by sediment derived from the land areas, swamping out the pelagic deposits. The distribution of terrigenous and bioclastic material on the ocean floors away from the margins is determined by the supply of the airborne dust, the biogenic productivity of carbonate-forming organisms, the productivity of siliceous organisms, the water depth and the ocean water circulation. The highest productivity of the biogenic material is in the warmer waters near the Equator and also in areas where there is a good supply of nutrients provided by ocean currents. In these regions there is a continuous ‘rain’ of calcareous and, to a much lesser extent, siliceous biogenic material down towards the sea floor: this ‘rain’ is less intense in cooler regions or areas with less nutrient supply. The solubility of calcium carbonate is partly dependent on pressure as well as temperature. At higher pressures and lower temperatures the amount of calcium carbonate that can be dissolved in a given mass of water increases. In oceans the pressure becomes greater with depth of water and the temperature drops so the solubility of calcium carbonate also increases. Near the surface most ocean waters are near to saturation with respect to calcium carbonate: animals and plants are able to extract it from seawater and precipitate either aragonite or calcite in shells and skeletons. 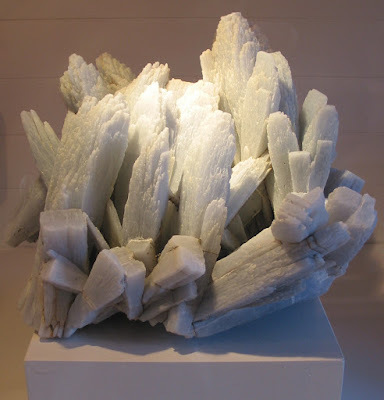 As biogenic calcium carbonate in the form of calcite falls through the water column it starts to dissolve at depths of around 3000 m and in most modern oceans will have been completely dissolved once depths of around 4000 m are reached. 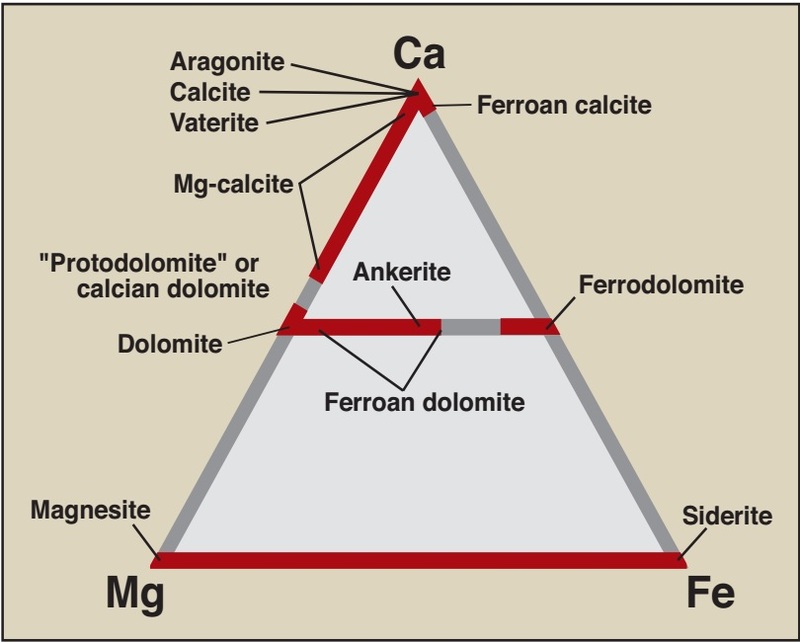 This is the calcite compensation depth (CCD). Aragonite is more soluble than calcite and an aragonite compensation depth can be defined at a higher level in the water column than a calcite compensation depth. The calcite compensation depth is not a constant level throughout the world’s oceans today. The capacity for seawater to dissolve calcium carbonate depends on the amount that is already in solution, so in areas of high biogenic productivity the water becomes saturated with calcium carbonate to greater depths and higher pressures are required to put the excess of ions into solution. The depth of the CCD is also known to vary with the temperature of the water and the degree of deep water circulation that is present. Above the CCD the remains of the less abundant siliceous organisms are swamped out by the carbonate material; below the CCD the skeletons of Radiolaria can form the main biogenic component of a pelagic sediment. High concentrations of siliceous organisms need not always indicate deep waters. The cold waters of polar regions favour diatoms over calcareous plankton and in pre-Mesozoic strata calcareous foraminifers and nanoplankton are not present. At water depths of around 6000 m the opaline silica that makes up radiolarians and diatoms is subject to dissolution because of the pressure and an opal compensation depth (or silica compensation depth) can be recognised. In the deepest ocean waters it may be expected that only pelagic clays would be deposited. In some parts of the world’s oceans this is the case, and there are successions of red-brown mudrocks in the stratigraphic record that are interpreted as hadal (very deep water) deposits. In some instances, these deepwater mudstones include thin beds of limestone and chert: radiolarian chert beds also sometimes include thin limestone beds. The occurrence of these beds might be explained in terms of fluctuations in the compensation depths, but a simpler explanation is that these deposits are actually turbidites and this can be verified by the presence of a very subtle normal grading within the beds. Carbonate, for example, can be deposited at depths below the CCD if it is introduced by a mechanism other than settling through the water column. If the material is brought into deep water by turbidity currents it will pass through the CCD quickly and will be deposited rapidly. The top of a calcareous turbidite may subsequently start to dissolve at the sea floor, but the waters close to the sea floor will soon become saturated with the mineral and little dissolution of a calcareous turbidite deposit occurs. Fine-grained sediment in the ocean water that has been directly derived from a nearby continent is referred to as hemipelagic. It consists of at least 25% non-biogenic material. 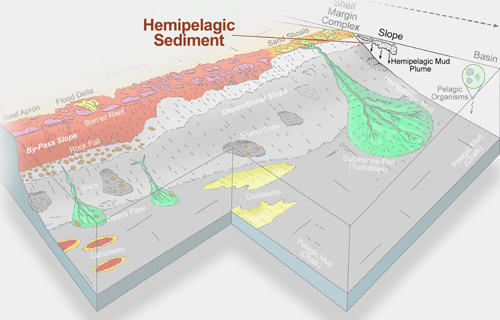 Hemipelagic deposits are classified as calcareous if more than 30% of the material is carbonate, terrigenous if more than half is detritus weathered from the land and there is less than 30% carbonate, or volcanigenic if more than half is of volcanic origin, with less than 30% of the material carbonate. Most of the material is brought into the oceans by currents from the adjacent landmass and is deposited at much higher rates than pelagic deposits (between 10 and over 100mm/yr ). Storm events may cause a lot of shelf sediment to be reworked and redistributed by both geostrophic currents and sediment gravity underflows. A lot of hemipelagic material is also associated with turbidity currents: mixing of the density current with the ocean water results in the temporary suspension of fine material and this remains in suspension for long after the turbidite has been deposited. The provenance and hence the general composition of the hemipelagic deposit will be the same as that of the turbidite. Consolidated hemipelagic sediments are mudrocks that may be shaly and can have a varying proportion of fine silt along with dominantly clay-sized material. The provenance of the material forms a basis for distinguishing hemipelagic and pelagic deposits: the former will be compositionally similar to other material derived from the adjacent continent, whereas pelagic sediments will have a different composition. Clay mineral and geochemical analyses can be used to establish the composition in these cases. Mudrocks interbedded with turbidites are commonly of hemipelagic origin, representing a long period of settling from suspension after the short event of deposition directly from the turbidity current. A variety of minerals precipitate directly on the sea floor. These chemogenic oceanic deposits include zeolites (silicates), sulphates, sulphides and metal oxides. The oxides are mainly of iron and manganese, and manganese nodules can be common amongst deep-sea deposits. The manganese ions are derived from hydrothermal sources or the weathering of continental rocks, including volcanic material, and become concentrated into nodules a few millimetres to 10 or 20 cm across by chemical and biochemical reactions that involve bacteria. This process is believed to be very slow, and manganese nodules may grow at a rate of only a millimetre every million years. They occur in modern sediments and in sedimentary rocks as rounded, hard, black nodules. At volcanic vents on the sea floor, especially in the region of ocean spreading centres, there are specialised microenvironments where chemical and biological activity result in distinctive deposits. The volcanic activity is responsible for hydrothermal deposits precipitated from water heated by the magmas close to the surface. Seawater circulates through the upper layers of the crust and at elevated temperatures it dissolves ions from the igneous rocks. Upon reaching the sea floor, the water cools and precipitates minerals to form deposits localised around the hydrothermal vents: these are black smokers rich in iron sulphide and white smokers composed of silicates of calcium and barium that form chimneys above the vent several metres high. The communities of organism that live around the vents are unusual and highly specialised: they include bacteria, tubeworms, giant clams and blind shrimps. Ancient examples of mid-ocean hydrothermal deposits have been found in ophiolite suites but fossil fauna are sparse. The architectural elements described are found in various proportions and are made up of different grain sizes of material depending on the characteristics and volume of the sediment supplied to the submarine fan. 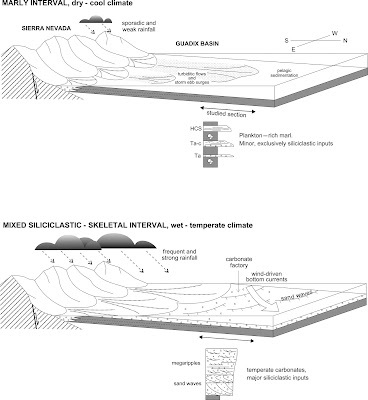 Any combination is possible, but it is convenient to consider four representative models: gravel-dominated, sandy, mixed sand and mud, and muddy, with the usual caveat that any intermediate form can exist. Submarine fan systems are commonly divided into upper fan (inner fan), mid-fan and lower fan (outer fan) areas: in these schemes the upper fan is dominated by channel and levee complexes, the mid-fan by depositional lobes and the lower fan by sheets. Although this works well for some examples (e.g. sandy and mixed systems) the divisions are not so appropriate for gravelly and muddy systems. Coarse sediment may be deposited at the edge of a basin in coarse-grained deltas supplied by braided river or alluvial fans. The deeper parts of these deltas can merge into small submarine fans of material forming wedge-shaped bodies at the base of the slope. The gravel is mainly deposited by debris flows and sands are rapidly deposited by high-density turbidity currents. These fan bodies tend to pass abruptly into thin-bedded distal turbidites and hemipelagic mudstones. A submarine fan system is considered to be sand-rich if at least 70% of the deposits in the whole system are sandy material. They are usually sourced from sand-rich shelves where waves, storms and tidal currents have sorted the material, removing most of the mud and leaving a sand-rich deposit that is reworked by turbidity currents. 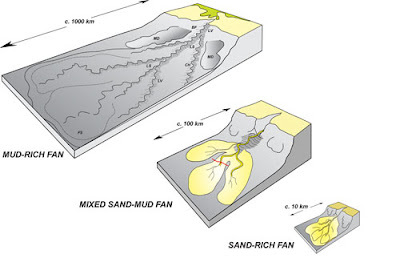 Sand-rich turbidity currents have a low efficiency and do not travel very far, so the fan body is likely to be relatively small, less than 50 km in radius. Deposition is largely by high-density turbidity currents and the fan is characterised by sandy channels and lobes. The inner fan area is dominated by channels with some lobes, while the mid-fan area is mainly coalesced lobes, often channelised. Due to the low transport efficiency the transition to finer grained sheet deposits of the lower fan is abrupt. Inactive areas of the fan (abandoned lobes) become blanketed by mud. Strata formed by these systems consist of thick, moderately extensive packages of sandy highdensity turbidites separated by mud layers that represent the periods of lobe abandonment. Where a river/delta system provides large quantities of both sandy and muddy material, a mixed sand–mud depositional system results; these systems are defined as consisting of between 30% and 70% sand. These higher efficiency systems are tens to hundreds of kilometres in diameter and consist of well-developed channel levee systems and depositional lobes. Deposits in the channels in the inner and mid-fan areas include lags of coarse sandstone, sandy, high-density turbidite beds and channel abandonment facies that are muddy turbidites. They form lenticular units flanked by levee deposits of thin, fine-grained turbidites and muds. The depositional lobes of the mid-fan are very variable in composition, including both high- and lower density turbidites, becoming muddier in the lower fan area. In a sedimentary succession, the lobe deposits form very broad lenses encased in thin sheets of the lower fan and muds of the basin plain. The largest submarine fan systems in modern oceans are mud-rich, and are fed by very large rivers. These large mud-rich fans include the Bengal Fan fed by the Ganges and Brahmaputra rivers and the large submarine fan beyond the mouth of the Mississippi. These submarine fan systems are over 1000 km in radius and consist of less than 30% sand. Channels are the dominant architectural element of these systems and when some modern submarine fan channels are viewed in plan they are seen to follow a strongly sinuous course that looks like a meandering river pattern. The channels deposits are sandy while some sand and more mud are deposited on the channel margins as well-developed levees. Depositional lobes are rather poorly developed and thin: the outer fan area consists mainly of thin sandstone sheets interbedded with mudrocks of the basin plain. In a succession of mud-rich fan deposits the sandstone occurrences are limited to lenticular channel units and isolated, thin lobes and sheets in the lower fan. Successions of turbidites are found in places where deep-sea deposits have been uplifted by tectonic forces and are now exposed on land: this occurs at ocean margins where accretionary prisms form and around mountain belts where foreland basin deposits are thrust to the surface. The beds are commonly quite deformed, having been folded and faulted during the process of uplift, so interpretation of the successions, which may be many thousands of metres thick, is not always easy. The type of depositional system can be assessed by considering the ranges of the grain sizes of the material and the distribution of channel, levee, lobe and sheet facies. Because of the size of most submarine fan systems, the beds exposed will often represent only a very small part of a whole system, even if the outcrop extends for tens of kilometres or more. The palaeogeography of the system can be established by using the distribution of the different facies, and by using indicators of palaeo flow. Scouring during the flow of a turbidity current leaves marks on the underlying surface that are filled in as casts when deposition subsequently occurs. These scour and tool marks can be very abundant on the bases of turbidite sandstone beds and measurement of their orientation can be used to determine the direction of flow of the turbidity current: flute marks indicate the flow direction while groove marks show the orientation of the axis of the flow. Cross-lamination in the Bouma ‘c’ division can also be measured and used as a palaeocurrent indicator. Palaeoflow indicators in turbidites provide reliable information about where the source area was (back-tracking along the flow directions), except where a turbidity current encounters an obstacle and is diverted or in small basins where they may flow all the way across to the opposite margin and rebound back again. Through time a deep-water basin may be wholly or partially filled up with the deposits of a submarine fan. During this process the fan system will prograde as it builds out into the basin. This means that the deposits of the lower fan will be overlain by mid-fan deposits and capped by upper fan facies, but the succession is unlikely to be as simple as presented in this diagram. A submarine fan is a body of sediment on the sea floor deposited by mass-flow processes that may be fan-shaped, but more elongate, lobate geometries are also common. They vary in size from a few kilometres radius to depositional systems covering over a million square kilometres and forming some of the largest geomorphological features on Earth. The morphology and depositional character of submarine fan systems are strongly controlled by the composition of the material supplied, particularly the proportions of gravel, sand and mud present. In this sense submarine fans are very much like other depositional systems such as deltas which also show considerable variability depending on the grainsize distribution in the material supplied. Note that although coarse-grained deltas are sometimes referred to as fan deltas and are largely submarine, the term submarine fan is restricted to fan-shaped bodies that are deposited by mass-flow, mainly turbidity current, processes. A submarine fan could form of any clastic material, but the larger fans are all composed of terrigenous clastic material supplied by large river systems. Carbonate shelves can be important sources of sediment redeposited in the ocean basins by turbidites, but the supply of carbonate sediment is rarely focused at discrete points along the continental slope: submarine fans composed of carbonate material are therefore rarely formed, and most carbonate turbidites are associated with slope-apron systems. A submarine fan can be divided into a number of ‘architectural elements’, components of the depositional system that are the products of different processes and subenvironments of deposition. Submarine fan channels form distinct elements on the fan surface and may have levees associated with them: these channels may incise into, or pass distally into, depositional lobes, which are broad, slightly convex bodies of sediment. The canyons that incise into the shelf edge funnel sediment and water to discrete points at the edge of the ocean basin where turbidity currents flowing down the canyons pass into channels. Unlike the canyons, the channels are not incised into bedrock, but may scour into underlying submarine fan deposits. Submarine fan channels are variable in size: some of the larger modern examples are several tens of kilometres wide and over a thousand metres deep, and in the stratigraphic record there are submarine fan channels with thicknesses of up to 170 m and 20 km across. The deposits in the channel are typically coarse sands and gravel that form thick, structureless or crudely graded beds characterised by Tab of the Bouma sequence and S1–3 of the ‘Lowe-type’ high-density turbidite model. The lateral extent of these turbidite beds is limited by the width of the channel, which, when it is filled, forms a lenticular body made up of stacked coarse-grained turbidites. Most of an individual turbidity flow is confined to the channel but the upper, more dilute part of the flow may spill out of the channel laterally. This is analogous to the channel and overbank setting familiar from fluvial environments. The overbank flow from the channel contains fine sand, silt and mud and this spreads out as a finegrained turbidity current away from the channel to form a submarine channel levee. The levee turbidites consist of the upper parts of Bouma sequences and they thin away from the channel margin with a low-angle, wedge-shaped geometry. Levee successions can build up to form units hundreds of metres thick, especially if the channel is aggrading, that is, filling up with sediment and building up its banks at the same time. Channel and levee complexes are also preserved when the channel migrates laterally or avulses, to leave its former position abandoned. At the distal ends of channels the turbidity currents spread out to form a lobe of turbidite deposits that occupies a portion of the fan surface. 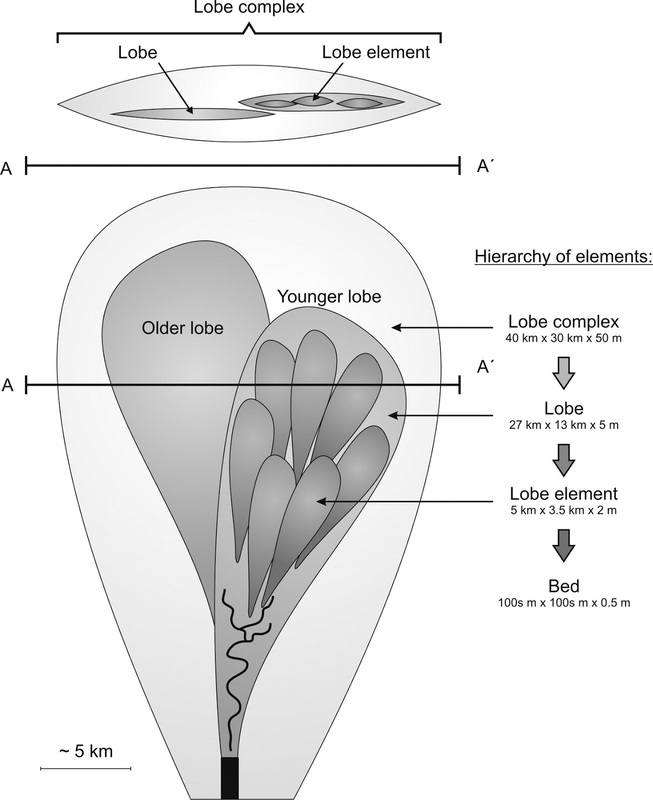 An individual lobe is constructed by a succession of turbidity currents that tend to deposit further and further out on the lobe through time. A simple progradational geometry results if fan deposition is very ordered, with each turbidity current event of approximately the same magnitude and each depositing progressively further from the mouth of the channel. However, turbidity currents are of varying magnitude and so the pattern tends to be more complex. As the lobe builds out the flow in the more proximal part tends to become channelised. Lobe progradation continues until the channel avulses to another part of the fan. Avulsion occurs because an individual lobe will start to build up above the surrounding fan surface and eventually flows start to follow the slightly steeper gradient on to a lower area of the fan. The succession built up by depositional lobe progradation is ideally a coarsening-up succession capped by a channelised unit. Individual turbidites will show normal grading but as the lobe progrades currents will carry coarser sediment further out on the fan surface. Successive deposits therefore should contain coarser sediment and hence generate an overall coarsening-up pattern. A thickening-up of the beds should accompany the coarsening-up pattern. Commonly this overall coarsening-up and thickening-up is not seen because of the complex, often random pattern of deposition on depositional lobes. Therefore there may not be any consistent vertical pattern of beds deposited on a submarine fan lobe. Depositional lobe deposits often contain the most complete Bouma sequences. The whole lobe succession may be tens to hundreds of metres thick and an individual lobe may be kilometres or tens of kilometres across. 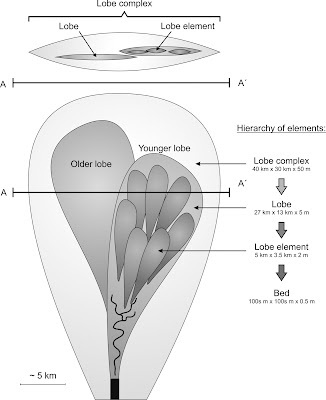 Lobes will be stacked both vertically and laterally against each other, although the lateral limits of an individual lobe may be difficult to identify. Turbidite sheets are deposits of turbidity currents that are not restricted to deposition on a lobe but have spread out over a larger area of the fan. They are thin, fine-grained turbidites characterised by Bouma divisions Tc–e and Tde with little or no organisation into patterns or trends in grain size and bed thickness. Interbedding with hemipelagic mudstones is common. Altogether 71% of the area of the globe is occupied by ocean basins that have formed by sea-floor spreading and are floored by basaltic oceanic crust. The midocean ridge spreading centres are typically at 2000 to 2500 m depth in the oceans. Along them the crust is actively forming by the injection of basic magmas from below to form dykes as the molten rock solidifies and the extrusion of basaltic lava at the surface in the form of pillows. This igneous activity within the crust makes it relatively hot. As further injection occurs and new crust is formed, previously formed material gradually moves away from the spreading centre and as it does so it cools, contracts and the density increases. The older, denser oceanic crust sinks relative to the younger, hotter crust at the spreading centre and a profile of increasing water depth away from the mid-ocean ridge results down to around 4000 to 5000 m where the crust is more than a few tens of millions of years old. The ocean basins are bordered by continental margins that are important areas of terrigenous clastic and carbonate deposition. Sediment supplied to the ocean basins may be reworked from the shallow marine shelf areas, or is supplied directly from river and delta systems and bypasses the shelf. There is also intrabasinal material available in ocean basins, comprising mainly the hard part of plants and animals that live in the open oceans, and airborne dust that is blown into the oceans. These sources of sediment all contribute to oceanic deposits. The large clastic depositional systems are mainly found near the margins of the ocean basin, although large systems may extend a thousand kilometres or more out onto the basin plain, and the ocean basin plains provide the largest depositional environments on Earth. The problem with these deep-water depositional systems, however, is the difficulty of observing and measuring processes and products in the present day. The deep seas are profoundly inaccessible places. Our knowledge is largely limited to evidence from remote sensing: detailed bathymetric surveys, side-scan sonar images of the sea floor and seismic reflection surveys of the sediments. There are also extremely localised samples from boreholes, shallow cores and dredge samples. Our database of the modern ocean floors is comparable to that of the surface of the Moon and understanding the sea floor is rather like trying to interpret all processes on land from satellite images and a limited number of hand specimens of rocks collected over a large area. However, our knowledge of deep-water systems is rapidly growing, partly through technical advances, but also because hydrocarbon exploration has been gradually moving into deeper water and looking for reserves in deep-water deposits. Continental slopes typically have slope angles of between 28 and 108 and the continental rise is even less. Nevertheless, they are physiographically significant, as they contrast with the very low gradients of continental shelves and the flat ocean floor. Continental slopes extend from the shelf edge, about 200m below sea level, to the basin floor at 4000 or 5000 m depth and may be up to a hundred kilometres across in a downslope direction. Continental slopes are commonly cut by submarine canyons, which, like their counterparts on land, are steep-sided erosional features. Submarine canyons are deeply incised, sometimes into the bedrock of the shelf, and may stretch all the way back from the shelf edge to the shoreline. They act as conduits for the transfer of water and sediment from the shelf, sometimes feeding material directly from a river mouth. The presence of canyons controls the formation and position of submarine fans. The generally flat surface of the ocean floor is interrupted in places by seamounts, underwater volcanoes located over isolated hotspots. Seamounts may be wholly submarine or may build up above water as volcanic islands, such as the Hawaiian island chain in the central Pacific. As subaerial volcanoes they can be important sources of volcaniclastic sediment to ocean basins. The flanks of the volcanoes are commonly unstable and give rise to very largescale submarine slides and slumps that can involve several cubic kilometres of material. Bathymetric mapping and sonar images of the ocean floor around volcanic islands such as Hawaii in the Pacific and the Canary Islands in the Atlantic have revealed the existence of very large-scale slump features. Mass movements on this scale would generate tsunami around the edges of the ocean, inundating coastal areas. The deepest parts of the oceans are the trenches formed in regions where subduction of an oceanic plate is occurring. Trenches can be up to 10,000 m deep. Where they occur adjacent to continental margins (e.g. the Peru–Chile Trench west of South America) they are filled with sediment supplied from the continent, but mid-ocean trenches, such as the Mariana Trench in the west Pacific, are far from any source of material and are unfilled, starved of sediment. Deposition of most clastic material in the deep seas is by mass-flow processes. The most common are debris flows and turbidity currents, and these form part of a spectrum within which there can be flows with intermediate characteristics. Remobilisation of a mass of poorly sorted, sedimentrich mixture from the edge of the shelf or the top of the slope results in a debris flow, which travels down the slope and out onto the basin plain. Unlike a debris flow on land an underwater flow has the opportunity to mix with water and in doing so it becomes more dilute and this can lead to a change in the flow mechanism and a transition to a turbidity current. The top surface of a submarine debris flow deposit will typically grade up into finer deposits due to dilution of the upper part of the flow. Large debris flows of material are known from the Atlantic off northwest Africa and examples of thick, extensive debris-flow deposits are also known from the stratigraphic record. Debris-flow deposits tens of metres thick and extending for tens of kilometres are often referred to as megabeds. Dilute mixtures of sediment and water moving as mass flows under gravity are the most important mechanism for moving coarse clastic material in deep marine environments. These turbidity currents carry variable amounts of mud, sand and gravel tens, hundreds and even over a thousand kilometres out onto the basin plain. The turbidites deposited can range in thickness from a few millimetres to tens of metres and are carried by flows with sediment concentrations of a few parts per thousand to 10%. Denser mixtures result in high-density turbidites that have different characteristics to the ‘Bouma Sequences’ seen in low- and medium-density turbidites. Direct observation of turbidity currents on the ocean floor is very difficult but their effects have been monitored on a small number of occasions. In November 1929 an earthquake in the Grand Banks area off the coast of Newfoundland initiated a turbidity current. The passage of the current was recorded by the severing of telegraph cables on the sea floor, which were cut at different times as the flow advanced. Interpretation of the data indicates that the turbidity current travelled at speeds of between 60 and 100 km. Also, the deposits of recent turbidity flows have been mapped out, for example, in the east Atlantic off the Canary Islands a single turbidite deposit has been shown to have a volume of 125 km cube. A deep marine depositional system is considered to be a low-efficiency system if sandy sediment is carried only short distances (tens of kilometres) out onto the basin plain and a high-efficiency system if the transport distances for sandy material are hundreds of kilometres. High-volume flows are more efficient than small-volume flows and the efficiency is also increased by the presence of fines that tend to increase the density of the flow and hence the density contrast with the seawater. The deposits of low-efficiency systems are therefore concentrated near the edge of the basin, whereas muddier, more efficient flows carry sediment out on to the basin plain. The high-efficiency systems will tend to have an area near the basin margin called a bypass zone where sediment is not deposited, and there may be scouring of the underlying surface, with all the deposition concentrated further out in the basin. Turbidity currents and mass flows require some form of trigger to start the mixture of sediment and water moving under gravity. This may be provided by an earthquake as the shaking generated by a seismic shock can temporarily liquefy sediment and cause it to move. The impact of large storm waves on shelf sediments may also act as a trigger. Accumulation of sediment on the edge of the shelf may reach the point where it becomes unstable, for example where a delta front approaches the edge of a continental shelf. High river discharge that results in increased sediment supply can result in prolonged turbidity current flow as sediment-laden water from the river mouth flows as a hyperpycnal flow across the shelf and down onto the basin plain. Such quasi-steady flows may last for much longer periods than the instantaneous triggers that result in flows lasting just a few hours. A fall in sea level exposes shelf sediments to erosion, more storm effects and sediment instability that result in increased frequency of turbidity currents. The detrital material in deep-water deposits is highly variable and directly reflects the sediment source area. Sand, mud and gravel from a terrigenous source are most common, occurring offshore continental margins that have a high supply from fluvial sources. Material that has had a short residence time on the shelf will be similar to the composition of the river but extensive reworking by wave and tide processes can modify both the texture and the composition of the sediment before it is redeposited as a turbidite. A sandstone deposited by a turbidity current can therefore be anything from a very immature, lithic wacke to a very mature quartz arenite. Turbidites composed wholly or partly of volcaniclastic material occur in seas offshore of volcanic provinces. The deep seas near to carbonate shelves may receive large amounts of reworked shallow-marine carbonate sediment, redeposited by turbidity currents and debris flows into deeper water: recognition of the redeposition process is particularly important in these cases because the sediment will contain bioclastic material that is characteristic of shallow water environments. Because there is this broad spectrum of sandstone compositions in deep-water sediments, the use of the term ‘greywacke’ to describe the character of a deposit is best avoided: it has been used historically as a description of lithic wackes that were deposited as turbidites and the distinction between composition and process became confused as the terms turbidite and greywacke came to be used almost as synonyms. ‘Greywacke’ is not part of the Pettijohn classification of sandstones and it no longer has any widely accepted meaning in sedimentology. The depositional environments described are made up of ‘pure’ carbonate and evaporite deposits that do not contain terrigenous clastic or volcaniclastic material. There are, however, modern environments where the sediments are mixtures of carbonate and other clastic materials, and in the stratigraphic record many successions consist of mixtures of limestones, sandstones and mudstones. These typically occur in shallow-marine settings. The changes from carbonate to non-carbonate deposition and vice versa are the result of variations in the supply of terrigenous clastic material and this is in turn determined by tectonic or climatic factors, or fluctuations in sea level. Climate plays an important role in determining the supply of sand and mud to shallow marine environments. Under more humid conditions, the increased run-off on the land surface results in more sediment being carried by rivers, which are themselves more vigorous and hence deliver more sediment to the adjacent seas. A change to a wetter climate on an adjacent landmass will therefore result in increased deposition of sand and mud, which will suppress carbonate production on a shelf. Alternation of beds of limestone with beds of mudstone or sandstone may therefore be due to periodic climatic fluctuations of alternating drier and wetter conditions. However, other mechanisms can also cause fluctuations in the supply of detritus from the continent to parts of the shelf. Tectonic uplift of the landmass can also increase the sediment supply by increasing relief and hence the rate of erosion. 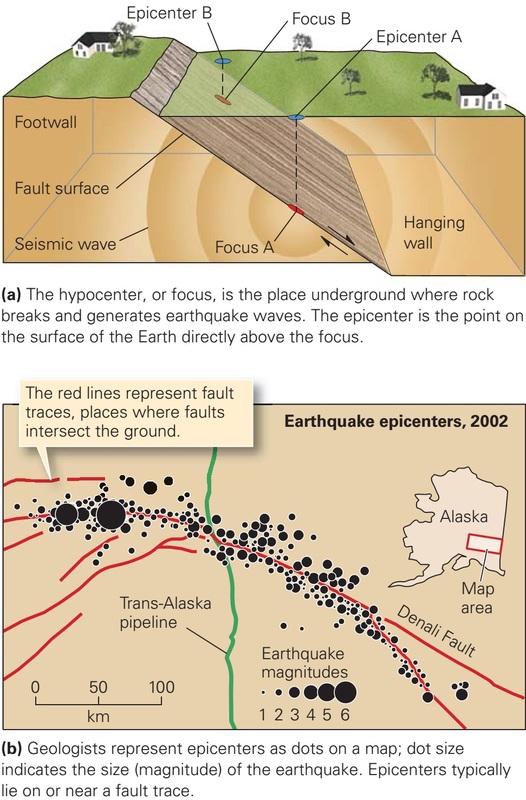 Tectonic activity can also result in subsidence of the shelf, which will make the water deeper across the shelf area: a relative sea-level rise will have the same effect. With increased water depth, more of the shelf area will be ‘starved’ of mud and sand, allowing carbonate sedimentation to occur in place of clastic deposition. Fluctuations in sea level may therefore result in alternations between limestone and mudstone/sandstone deposition. Carbonate deposits can co-exist with terrigenous clastic and volcaniclastic sediments under certain conditions. Deltas built by ephemeral rivers in arid environments may experience long periods without supply of debris and during these intervals carbonates may develop on the delta front, for example, in the form of small reefs that build up in the shallow marine parts of ephemeral fan-deltas. Time intervals between eruption episodes in island arc volcanoes may be long enough for small carbonate platforms to develop in the shallow water around an island volcano, giving rise to an association between volcanic and carbonate deposition. mineralogy – calcite and aragonite. texture – variable, biogenic structures in reefs, well sorted in shallow water. bed geometry – massive reef build-ups on rimmed shelves and extensive sheet units on ramps. sedimentary structures–cross-bedding in oolite shoals. palaeocurrents – not usually diagnostic, with tide, wave and storm driven currents. fossils – usually abundant, shallow marine fauna most common. colour – usually pale white, cream or grey. facies associations – may occur with evaporites, associations with terrigenous clastic material may occur. lithology – gypsum, anhydrite and halite. texture – crystalline or amorphous. bed geometry – sheets in lagoons and barred basins, nodular in sabkhas. 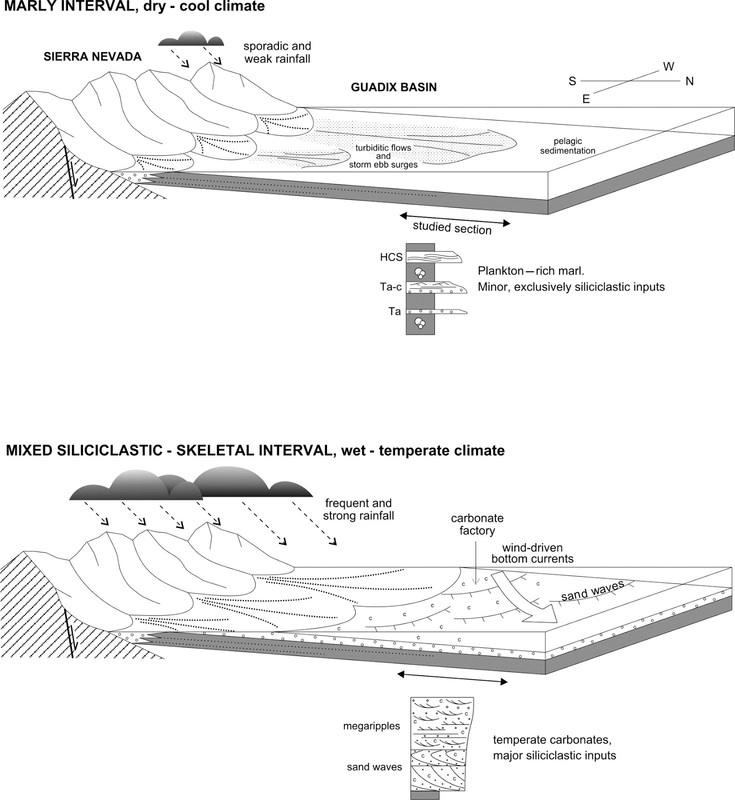 sedimentary structures – intrastratal solution breccias and deformation. colour – typically white, but may be coloured by impurities. facies associations – often with shallow marine carbonates. 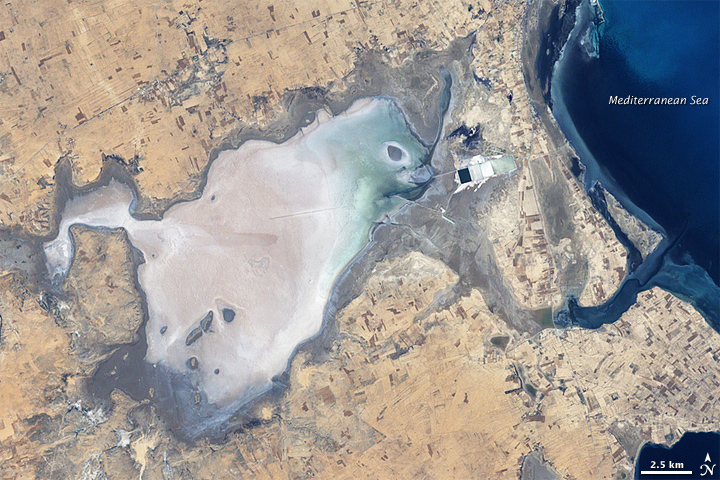 Evaporite deposits in modern marine environments are largely restricted to coastal regions, such as evaporite lagoons and sabkha mudflats. However, evaporite successions in the stratigraphic record indicate that precipitation of evaporite minerals has at times occurred in more extensive marine settings. In arid regions the restriction of the circulation on the inner ramp/shelf can lead to the formation of extensive platform evaporites. On a gently sloping ramp a sand shoal can partially isolate a zone of very shallow water that may be an area of evaporite precipitation; the subtidal zone here often merges into a low-energy mudflat coastline. Shelf lagoons behind rims formed by reefs or sand shoals can create similar areas of evaporite deposition, although the barrier formed by a reef usually allows too much water circulation. Evaporite units deposited on these platforms can be tens of kilometres across. Evaporite sedimentation occurs only in situations where a body of water becomes partly isolated from the ocean realm and salinity increases to supersaturation point and there is chemical precipitation of minerals. 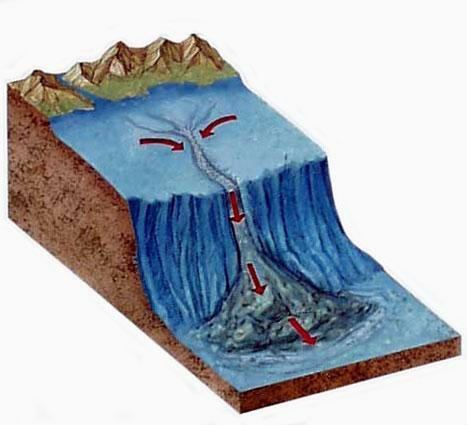 This can occur in epicontinental seas or small ocean basins that are connected to the open ocean by a strait that may become blocked by a fall in sea level or by tectonic uplift of a barrier such as a fault block. These are called barred basins and they are distinguished from lagoons in that they are basins capable of accumulating hundreds of metres of evaporite sediment. To produce just a metre bed of halite a column of seawater over 75 m deep must be evaporated, and to generate thick succession of evaporite minerals the seawater must be repeatedly replenished. Deposition of the thick succession can be produced in three ways each of which will produce characteristic patterns of deposits. 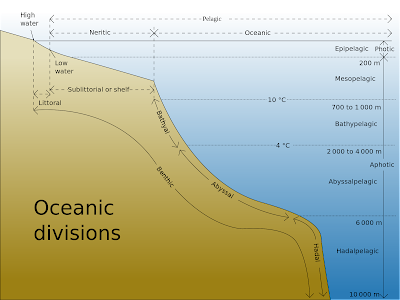 A shallow-water to deep-basin setting exists where a basin is well below sea level but is only partly filled with evaporating seawater, which is periodically replenished. The deep-water setting will be evident if the basin subsequently fills with seawater and the deposits overlying the evaporites show deep marine characteristics such as turbidites. A shallow-water to shallow-basin setting is one in which evaporites are deposited in salterns but continued subsidence of the basin allows a thick succession to be built up. The deposits will show the characteristics of shallow-water deposition throughout. 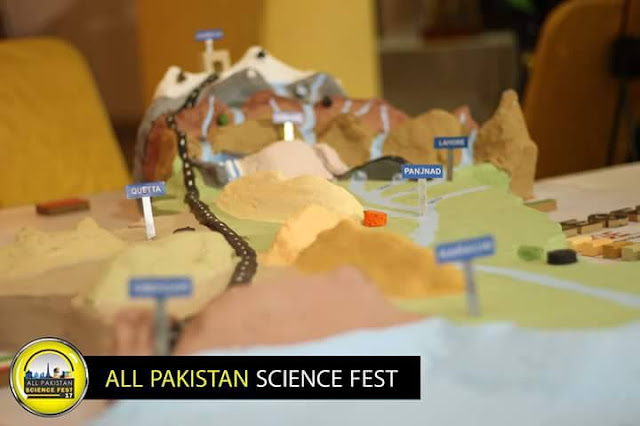 A deep-water to deep-basin setting is a basin filled with hypersaline water in which evaporite sediments are formed at the shallow margins and are redeposited by gravity flows into deeper parts of the basin. Normally graded beds generated by turbidites and poorly sorted deposits resulting from debris flows are evidence of redeposition. Other deep-water facies are laminated deposits produced by settling of crystals of evaporite minerals out of the water body. As a basin fills up, the lower part of the succession will be deeper water facies and the overlying succession will show characteristics of shallow-water deposition. Deep-basin succession can show two different patterns of deposition. If the barred basin is completely enclosed the water body will gradually shrink in volume and area and the deposits that result will show a bulls-eye pattern with the most soluble salts in the basin centre. In circumstances where there is a more permanent connection a gradient of increasing salinity from the connection with the ocean to the furthest point into the basin will exist. The minerals precipitated at any point across the basin will depend on the salinity at the point and may range from highly soluble sylvite (potassium chloride) at one extreme to carbonates deposited in normal salinities at the other. If equilibrium is reached between the inflow and the evaporative loss then stable conditions will exist across the basin and tens to hundreds of metres of a single mineral can be deposited in one place. This produces a teardrop pattern of evaporite basin facies. Changes in the salinity and amount of seawater in the basins result in variations in the types of evaporite minerals deposited. For example, a global sea-level rise will reduce the salinity in the basin and may lead to widespread carbonate deposition. Cycles in the deposits of barred basins may be related to global sea-level fluctuations or possibly due to local tectonics affecting the width and depth of the seaway connection to the open ocean. Organic material brought into the basin during periods of lower salinity can accumulate within the basin deposits and be preserved when the salinity increases because hypersaline basins are anoxic. There are no modern examples of very large, barred evaporitic basins but evidence for seas precipitating evaporite minerals over hundreds of thousands of square kilometres exist in the geological record. These saline giants have over 1000 m thickness of evaporite sediments in them and represent the products of the evaporation of vast quantities of seawater. Evaporite deposits of latest Miocene (Messinian) age in the Mediterranean Sea are evidence of evaporative conditions produced by partial closure of the connection to the Atlantic Ocean. This period of hypersaline conditions in the Mediterranean is sometimes referred to as the Messinian salinity crisis. A number of different morphologies of carbonate platform are recognised, the most widely documented being carbonate ramps, which are gently sloping platforms, and rimmed shelves, which are flat-topped platforms bordered by a rim formed by a reef or carbonate sand shoal. The tectonic setting influences the characteristics of carbonate platforms, with the largest occurring on passive continental margins while smaller platforms form on localised submarine highs such as fault blocks in extensional settings and on salt diapirs. 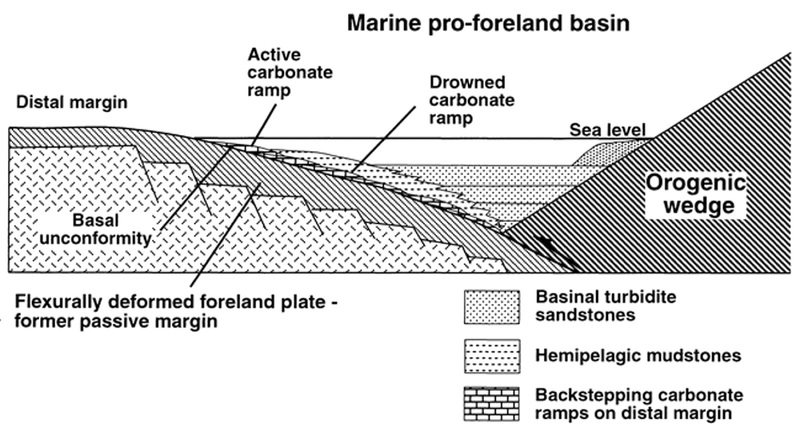 The different types of carbonate platform can sometimes occur associated with each other: an isolated platform may be a carbonate ramp on one side and a rimmed shelf on the other and one form may evolve into another, for example, a ramp may evolve into a rimmed shelf as a fringing reef develops. The bathymetric profile of a carbonate ramp and the physical processes within the sea and on the sea floor are very similar to an open shelf with clastic deposition. The term ‘ramp’ may give the impression of a significant slope but in fact the slope is a gentle one of less than a degree in most instances, in contrast to slope environments associated with rimmed shelves, which are much steeper. Modern ramps are in places where reefs are not developed, such as regions of cooler waters, increased salinity or relatively high input of terrigenous clastic material. However, in the past carbonate ramps formed in a wider range of climatic and environmental settings, especially during periods when reef development was not so widespread. 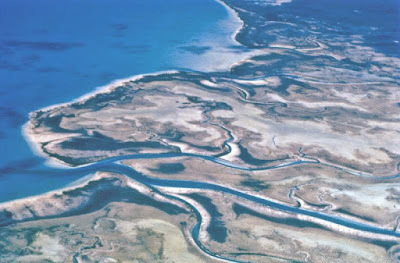 In macro- to mesotidal regimes tidal currents distribute carbonate sediment and strongly influence the coastal facies. Wave and storm processes are dominant in microtidal shelves and seas. 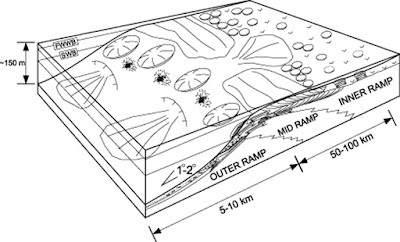 The effects of tides, waves and storms are all depth-dependent and ramps can be divided into three depth-related zones: inner, mid- and outer ramp. The inner ramp is the shallow zone that is most affected by wave and/or tidal action. Coastal facies along tidally influenced shorelines are characterised by deposition of coarser material in channels and carbonate muds on tidal flats. Wave-dominated shorelines may have a beach ridge that confines a lagoon or a linear strand plain attached to the coastal plain. Ramps with mesotidal regimes will show a mixture of beach barrier, tidal inlet, lagoon and tidal-flat deposition. Agitation of carbonate sediment in shallow nearshore water results in a shoreface facies of carbonate sand bodies. Skeletal debris and ooids formed in the shallow water form bioclastic and oolitic carbonate sand shoals. Benthic foraminifers are the principal components of some Tertiary carbonate ramp successions. The mid-ramp area lies below fair-weather wave base and the extent of reworking by shallow-marine processes is reduced. Storm processes transport bioclastic debris out on to the shelf to form deposits of wackestone and packstone, which may include hummocky and swaley cross-stratification. In deeper water below storm wave base the outer ramp deposits are principally redeposited carbonate mudstone and wackestone, often with the characteristics of turbidites. Redeposition of carbonate sediments is common in situations where the outer edge of the ramp merges into a steeper slope at a continental margin as a distally steepened ramp. Homoclinal ramps have a consistent gentle slope on which little reworking of material by mass-flow processes occurs. In contrast to rimmed shelves reefal build-ups are relatively rare in ramp settings. Isolated patch reefs may occur in the more proximal parts of a ramp and mud mounds are known from Palaeozoic ramp environments. A succession built up by the progradation of a carbonate ramp is characterised by an overall coarseningup from carbonate mudstone and wackestone deposited in the outer ramp environment to wackestones and packstones of the mid-ramp to packstone and grainstone beds of the inner ramp. The degree of sorting typically increases upwards, reflecting the higher energy conditions in shallow water. Inner ramp carbonate sand deposits are typically oolitic and bioclastic grainstone beds that exhibit decimetre to metre-scale cross-bedding and horizontal stratification. The top of the succession may include fine-grained tidal flat and lagoonal sediments. Ooids, broken shelly debris, algal material and benthic foraminifers may all be components of ramp carbonates. Locally mud mounds and patch reefs may occur within carbonate ramp successions. On shelves and epicontinental seas where there are fluctuations in relative sea level, cycles of carbonate deposits are formed on a carbonate ramp. A sea-level rise results in a shallowing-up cycle a few metres to tens of metres thick that coarsens up from beds of mudstone and wackestone to grainstone and packstone. A fall in sea level may expose the inner ramp deposits to dissolution in karstic subaerial weathering. Non-rimmed carbonate shelves are flat-topped shallow marine platforms that are more-or-less horizontal, in contrast to the gently dipping morphology of a carbonate ramp. They lack any barrier at the outer margin of the shelf (rimmed shelves) and as a consequence the shallow waters are exposed to the full force of oceanic conditions. These are therefore high-energy environments where carbonate sediments are repeatedly reworked by wave action in the inner part of the shelf and where redeposition by storms affects the outer shelf area. They therefore resemble storm-dominated clastic shelves, but the deposits are predominantly carbonate grains. Extensive reworking in shallow waters may result in grainstones and packstones, whereas wackestones and mudstones are likely to occur in the outer shelf area. Coastal facies are typically low energy tidal-flat deposits but a beach barrier may develop if the wave energy is high enough. A rimmed carbonate shelf is a flat-topped platform that has a rim of reefs or carbonate sand shoals along the seaward margin. The reef or shoal forms a barrier that absorbs most of the wave energy from the open ocean. Modern examples of rimmed shelves all have a coral reef barrier because of the relative abundance of hermatypic scleractinian corals in the modern oceans. 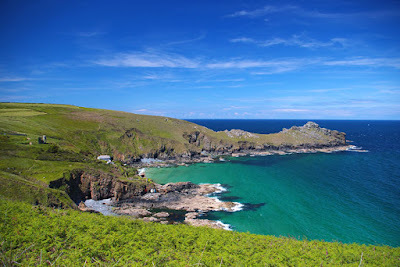 Landward of the barrier lies a low-energy shallow platform or shelf lagoon that is sheltered from the open ocean and may be from a few kilometres to hundreds of kilometres wide and vary in depth from a few metres to several tens of metres deep. In cases where the barrier is a reef, the edge of the shelf is made up of an association of reef-core, fore-reef and back-reef facies: the reef itself forms a bioherm hundreds of metres to kilometres across. Sand shoals may be of similar extent where they form the shelf-rim barrier. 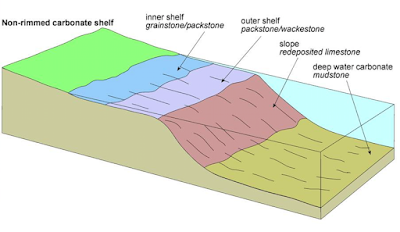 Progradation of a barrier results in steepening of the slope at the edge of the shelf and the slope facies are dominated by redeposited material in the form of debris flows in the upper part and turbidites on the lower part of the slope. These pass laterally into pelagic deposits of the deep basin. The back-reef facies near to the barrier may experience relatively high wave energy resulting in the formation of grainstones of carbonate sand and skeletal debris reworked from the reef. Further inshore the energy is lower and the deposits are mainly wackestones and mudstones. However, ooidal and peloidal complexes may also occur in the shelf lagoon and patch reefs can also form. In inner shelf areas with very limited circulation and under conditions of raised salinities the fauna tends to be very restricted. In arid regions evaporite precipitation may become prominent in the shelf lagoon if the barrier provides an effective restriction to the circulation of seawater. As deposition occurs on the rimmed shelf under conditions of static or slowly rising sea level the whole complex progrades. The reef core builds out over the fore reef and back-reef to lagoon facies overlie the reef bioherm. Distally the slope deposits of the fore reef prograde over deeper water facies comprising pelagic carbonate mud and calcareous turbidite deposits. The steep depositional slope of the fore reef creates a clinoform bedding geometry, which may be seen in exposures of rimmed shelf carbonates. This distinctive geometry can also be recognised in seismic reflection profiles of the subsurface. The association of reef-core boundstone facies overlying forereef rudstone deposits and overlain by finer grained sediments of the shelf lagoon forms a distinctive facies association. Under conditions of sea-level fall the reef core may be subaerially exposed and develop karstic weathering, and a distinctive surface showing evidence of erosion and solution may be preserved in the stratigraphic succession if subsequent sea-level rise results in further carbonate deposition on top. There are no modern examples of large epicontinental seas dominated by carbonate sedimentation but facies distributions in limestones in the stratigraphic record indicate that such conditions have existed in the past, particularly during the Jurassic and Cretaceous when large parts of the continents were covered by shallow seas. The water depth across an epicontinental platform would be expected to be variable up to a few tens to hundreds of metres. Both tidal and storm processes may be expected, with the latter more significant on platforms with small tidal ranges. Currents in broad shallow seas would build shoals of oolitic and bioclastic debris that may become stabilised into low-relief islands. Deposition in intertidal zones around these islands and the margins of the sea would result in the progradation of tidal flats. The facies successions developed in these settings would therefore be cycles displaying a shallowing-up trend, which may be traceable over large areas of the platform. Isolated platforms in areas of shallow sea surrounded on all sides by deeper water are commonly sites of carbonate sedimentation because there is no source of terrigenous detritus. They are found in a number of different settings ranging from small atolls above extinct volcanoes to horst blocks in extensional basins and within larger areas of shallow seas. All sides are exposed to open seas and the distribution of facies on an isolated platform is controlled by the direction of the prevailing wind. The characteristics of the deposits resemble those of a rimmed shelf and result in similar facies associations. The best developed marginal reef facies occurs on the windward side of the platform, which experiences the highest energy waves. Carbonate sand bodies may also form part of the rim of the platform. The platform interior is a region of low energy where islands of carbonate sand may develop and deposition occurs on tidal flats. Lithostratigraphy and geological maps as Part of the definition of a formation is that it should be a ‘mappable unit’, and in practice this usually means that the unit can be represented on a map of a scale of 1:50,000, or 1:100,000. Maps at this scale therefore show the distribution of formations and may also show where members and named beds occur. 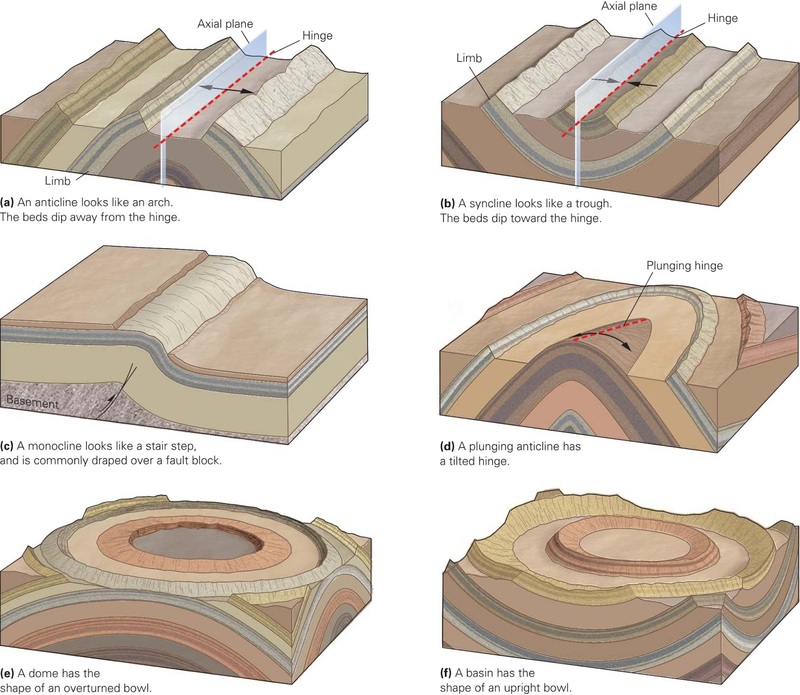 The stratigraphic order and, where appropriate, lateral relationships between the different lithostratigraphic units are normally shown in a stratigraphic key at the side of the map. In regions of metamorphic, intrusive igneous and highly deformed rocks the mapped units are lithodemes. There are no established rules for the colours used for different lithostratigraphic and lithodemic units on these maps, but each national geological survey usually has its own scheme. Geological maps that cover larger areas, such as a whole country or a continent, are different: they usually show the distribution of rocks in terms of chronostratigraphic units, that is, on the basis of their age, not lithology. It is clear from the earlier chapters on the processes and products of sedimentation that the environment of deposition has a fundamental control on the lithological characteristics of a rock unit. A formation, defined by its lithological characteristics, is therefore likely to be composed of strata deposited in a particular sedimentary environment. This has two important consequences for any correlation of formations in any chronostratigraphic (time) framework. First, in any modern environment it is obvious that fluvial sedimentation can be occurring on land at the same time as deposition is happening on a beach, on a shelf and in deeper water. In each environment the characteristics of the sediments will be different and hence they would be considered to be different formations if they are preserved as sedimentary rocks. It inevitably follows that formations have a limited lateral extent, determined by the area of the depositional environment in which they formed and that two or more different formations can be deposited at the same time. Second, depositional environments do not remain fixed in position through time. Consider a coastline where a sandy beach (foreshore) lies between a vegetated coastal plain and a shoreface succession of mudstones coarsening up to sandstones. The foreshore is a spatially restricted depositional environment: it may extend for long distances along a coast, but seawards it passes into the shallow marine, shoreface environment and landwards into continental conditions. The width of deposit produced in a beach and foreshore environment may therefore be only a few tens or hundreds of metres. However, a foreshore deposit will end up covering a much larger area if there is a gradual rise or fall of sea level relative to the land. If sea level slowly rises the shoreline will move landwards and through time the place where sands are being deposited on a beach would have moved several hundreds of metres. These depositional environments (the coastal plain, the sandy foreshore and the shoreface) will each have distinct lithological characteristics that would allow them to be distinguished as mappable formations. The foreshore deposits could therefore constitute a formation, but it is also clear that the beach deposits were formed earlier in one place (at the seaward extent) than another (at the landward extent). The same would be true of formations representing the deposits of the coastal plain and shoreface environments: through time the positions of the depositional environments migrate in space. From this example, it is evident that the body of rock that constitutes a formation would be diachronous and both the upper and lower boundaries of the formation are diachronous surfaces. There is also a relationship between environments of deposition and the hierarchy of lithostratigraphic units. In the case of a desert environment there may be three main types of deposits: aeolian sands, alluvial fan gravels and muddy evaporites deposited in an ephemeral lake. Each type of deposit would have distinctive lithological characteristics that would allow them to be distinguished as three separate formations, but the association of the three could usefully be placed into a group. A distinct change in environment, caused, perhaps, by sealevel rise and marine flooding of the desert area, would lead to a different association of deposits, which in lithostratigraphic terms would form a separate group. Subdivision of the formations formed in this desert environment may be possible if scree deposits around the edge of the basin occur as small patches amongst the other facies. When lithified the scree would form a sedimentary breccia, recognisable as a separate member within the other formations, but not sufficiently widespread to be considered a separate formation. Correlation in stratigraphy is usually concerned with considering rocks in a temporal framework, that is, we want to know the time relationships between different rock units – which ones are older, which are younger and which are the same age. Correlation on the basis of lithostratigraphy alone is difficult because, as discussed in the previous section, lithostratigraphic units are likely to be diachronous. In the example of the lithofacies deposited in a beach environment during a period of rising sea level the lithofacies has different ages in different places. Therefore the upper and lower boundaries of this lithofacies will cross time-lines (imaginary lines drawn across and between bodies of rock which represent a moment in time). If we can draw a time-line across our rock units, or, more usefully, a time-plane through an area of different strata, we would be able to reconstruct the distribution of palaeoenvironments at that time across that area. To carry out this exercise of making a palaeogeographic reconstruction we need to have some means of chronostratigraphic correlation, a means of determining the relative age of rock units which is not dependent on their lithostratigraphic characteristics. Radiometric dating techniques provide an absolute time scale but are not easy to apply because only certain rock types can be usefully dated. Biostratigraphy provides the most widely used time framework, a relative dating technique that can be related to an absolute time scale, but it often lacks the precision required for reconstructing environments and in some depositional settings appropriate fossils may be partly or totally absent (in deserts, for example). Palaeomagnetic reversal stratigraphy provides timelines, events when the Earth’s magnetism changed polarity, and may be applied in certain circumstances. The concept of sequence stratigraphy provides an approach to analysing successions of sedimentary rocks in a temporal framework. One of the most difficult questions to answer in sedimentology and stratigraphy is ‘how long did it take to form that succession of rocks?’. From our observations of sedimentary processes we can sometimes estimate the time taken to deposit a single bed: a debris-flow deposit on an alluvial fan may be formed over a few minutes to hours and a turbidite in deep water may have been accumulated over hours to days. However, we cannot simply add up the time it takes to deposit one bed in a succession and multiply it by the number of beds. We know from records of modern alluvial fans and deep seas that most of the time there is no sediment accumulating and that the time between depositional events is much longer than the duration of each event: in the case of the alluvial fan deposits and turbidites there may be hundreds or thousands of years between events. If we consider a succession of beds in terms of the passage of time, most of the time is represented by the surfaces that separate the beds: for example, if a debris flow event lasting one hour occurs every 100 years the time represented by the surfaces between beds is about a million times longer than the time taken to deposit the conglomerate. This is not a particularly extreme example: in many environments the time periods between events are much longer than events themselves – floods in the overbank areas of rivers and delta tops, storm deposits on shelves, volcanic ash accumulations, and so on. The exceptions are those places where material is gradually accumulating due to biogenic activity, such as a coral reef boundstone. 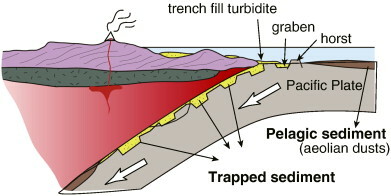 A bedding plane therefore represents a gap in the record, a hiatus in sedimentation, also sometimes referred to as a lacuna (plural lacunae). There are, however, some features that provide us with clues about the relative periods of time represented by the bedding surface. In continental environments, soils form on exposed sediment surfaces and the longer the exposure, the more mature the soil: analysis of palaeosols can therefore provide some clues and we can conclude that a very mature palaeosol profile in a succession would have formed during a long period without sedimentation. In shallow marine environments the sea floor is bioturbated by organisms, and the intensity of the bioturbation on a bedding surface can be used as an indicator of the length of time before the next depositional event. Sediment on the sea floor can also become partly or wholly lithified if left for long enough, and it may be possible to recognise firmgrounds, with associated Glossifungites-type ichnofauna, and hardgrounds with a Trypanites ichnofacies assemblage. Unconformities represent even longer gaps in the depositional record. On continental margins a sealevel fall may expose part of the shelf area, resulting in a period of non-deposition and erosion that will last until the sea level rises again after a period of time lasting tens to hundreds of thousands or millions of years. This results in an unconformity surface within the strata that represents a time period of that order of magnitude. Plate tectonics results in vertical movements of the crust and areas that were once places of sediment accumulation may become uplifted and eroded. Later crustal movements may cause subsidence, and the erosion surface will become preserved as an unconformity as it is overlain by younger sediment. Unconformity surfaces formed in this way may represent anything from less than a million to a billion years or more. The problems of determining how long it takes to deposit a succession of beds and the unknown periods of time represented by any lacunae, from a bedding plane to an unconformity, make it all-but impossible to gauge the passage of time from the physical characteristics of a sedimentary succession. In the 18th and 19th centuries various different estimates of the age of the Earth were made by geologists and these were all wildly different from the 4.5Ga we now know to be the case because they did not have any way of judging the period of time represented by the rocks in the stratigraphic record. Radiometric dating now provides us with a time frame that we can measure in years. This has made it possible to calibrate the stratigraphic chart that had already been developed for the Phanerozoic based on the occurrences of fossils.